Working at the Public Library, I am surrounded by readers. Not just our patrons, but also by my co-workers. Not surprising, most of our Library staff are avid leisure readers. Every now and again a given title will become a staff favourite and make the rounds among staff. A few years ago it was the YA novel The Jellicoe Road. 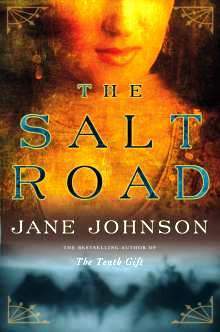 The Salt Road by Jane Johnson maybe the next one, if the first few staff reader's reactions are any indication. A beautifully crafted novel about the intertwining lives of two very intriguing women: Isabelle, a British accountant and Mariata, a member of the nomadic Tuareg Tribe in Morocco. The plot is triggered by a mysterious African amulet bequeathed to Isabelle by her archaeologist Father. Isabelle travels to Morocco, supposedly for a brief vacation, but soon finds herself on the quest of a lifetime on the Salt Road across the Sahara desert. This Salt Road is the same road that young Mariata travels down in her own quest, a quest to find happiness and her place in this world. Mariata's point of view is very different from Isabelle's, especially in terms of the geography and culture of the Sahara desert and what makes a person feel fulfilled. Both women discover important insights about their pasts as they make their way across the desert. Author Jane Johnson has delivered a winning combination of rich characters, beautiful settings, intriguing plot, compelling historical detail and insightful meditations on the values we place on modernity versus antiquity. Added in the mix is a splash of romance, mystery and a fantastic unexpected ending. When I asked my co-workers about the Salt Road, all have said "You have got to read this book!". Who I am to argue?